I wish I could say the all caps wasn’t me shrieking excitedly, but I’d be lying. 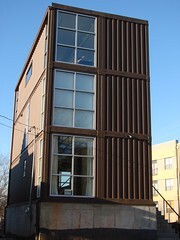 Why shipping container homes? Why not tiny homes? I’m a big fan of tiny homes, too, but I really love the concept of shipping container homes, their durability, modular construction, and if I’m being really honest, you can take the girl out of the playroom, but you can’t take the legos out of her pockets. They don’t have to look like modern boxes either, even though I’m a fan of that look. I’ve been re-reading an ebook I bought called “Introduction to Container Homes and Buildings” by Alex Klein from The Life and Times of a “Renaissance Ronin.” If you want the nitty gritty of this concept his blog is the go-to place. His book is even better. I don’t get any sort of affiliate link or commission for saying it, I’m just a long-term lurker on his blog.